When I was younger, I had a slight obsession with numbers and time, when I say slight I mean major, if someone said we'd be doing something in 5 minutes, i'd be staring at my forever friends watch until it had been exactly 5 minutes then i'd start hassling again, I liked my routine, I liked knowing when things would be happening and I needed things to run on time. So it was inevitable that Abbie was going to pick up on this trait too, her world reminds me exactly of how mine was at her age, she wants to know how long until everything is happening, and as parents we all casually say things like "2 minutes" "Later" or "Tomorrow" but just like me, she likes to know specifics so I decided it was the perfect time to get her, her very own clock, and despite only having it for a week or so, she's picked up on it so fast. This one is from the well known brand Hape, who are the world's largest producer of wooden toys, they pride themselves on being environmentally friendly, being dependant on natural resources, including an entire bamboo line and have even thought about their production in terms of keeping energy consumption to a minimum, it's always nice knowing you're helping the environment! 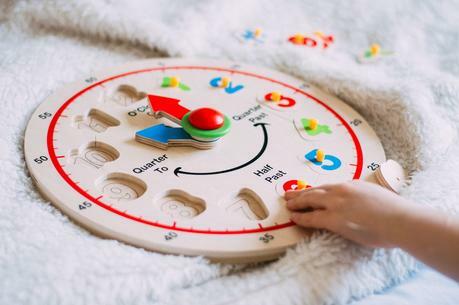 This Happy Hour Clock is colourful and educational, perfect for children aged 3 years and older. The Clock consists of 13 pieces. 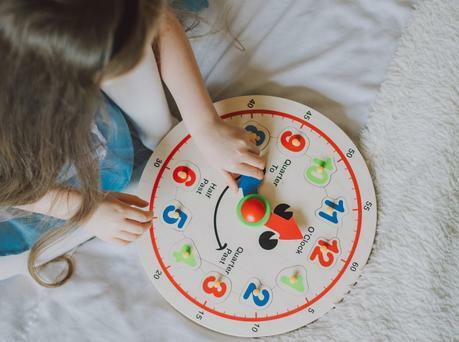 Sticking with a restricted color range of 4 colours, red, blue, yellow and green, the toy is not overwhelming and keeps the entertainment of learning. 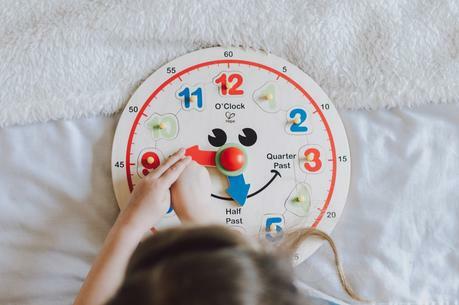 The clock has a big smiley face and easy portable pieces that children can take out of the base. 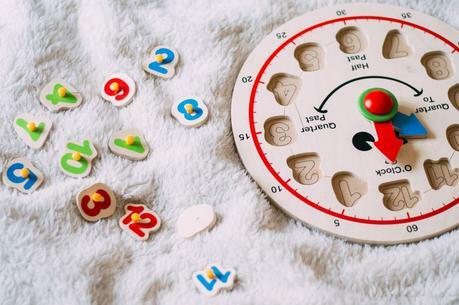 It helps teaches time, like hours and minutes along side learning about numbers and colours. 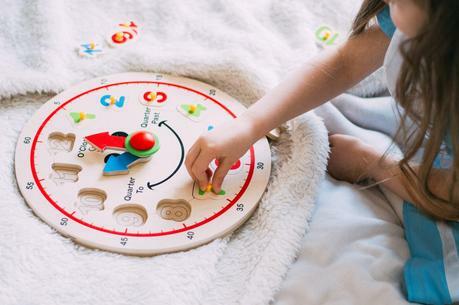 With the movable clock hands help your child understand the differences with hours, minutes, o’clock and half past. Developing their recognition skills and differentiation skills. 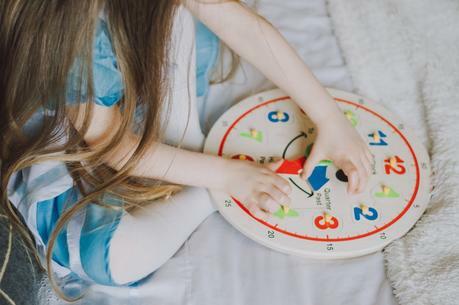 All their toys go through a rigorous testing regime, including the bite test, small parts test and sharp point test to ensure everything is suitable for your child, whatever their age. When it came to taking these photos, we sat down and I asked her to show me random times on the clock, such as 4.10, 6.30, 12.55 etc, and although she'd only had it for a week, she was already able to complete those with ease. What I love is that when she asks me what the time is, I can already point to the clock in the living room and ask her what she thinks it is and she's able to tell me, she will then come back over to this clock and match the time up. If I say 5 minutes until something, I will show her what the clock on the wall will look like when time is up, and she recognises it, she absolutely loves it! The next step in a few weeks will be to teach her about quarter past, half past etc, something I think will be a little trickier but with what she's learned so far, so quickly, think she will pick it up with great ease!